If you have returned from a family Christmas feeling particularly stressed it could be down to "jigsaw rage". University of Bath researchers have found people approach jigsaws in a number of different ways - and if two strategies clash, there can be trouble. This can lead to subversive acts such as hiding the last piece - to enable that person to be the "winner". 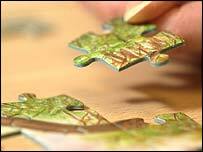 The study into collaboration said people ranged from 'border obsessives' to 'opportunistic' jigsaw puzzlers. The study, published in the journal ACM Transactions on Computer-Human Interaction and funded by the Engineering and Physical Sciences Research Council, will aid the development computer software that can help people collaborate on work projects. The researchers said examining how people tackle jigsaws, alone and with others, can give clues as to how people behave in such situations. People were asked to complete a 120-piece jigsaw, either alone or in a group and videoed as they did so. Extreme behaviour was observed. Players were seen refusing to allow a fellow player to touch their part of the jigsaw and squabbling over access to pieces. People were also seen shielding parts of the completed puzzle, hoarding piles of pieces and hiding the picture on the lid from others. The researchers found that 'border obsessives' focus exclusively on sorting through the entire stock of pieces for the sole purpose of completing the border before concentrating on the rest of the puzzle. 'Opportunists', in contrast, are much more creative in their approach, sorting piles on more complex criteria and completing the puzzle using a range of different methods, such as from the top of the picture down to the bottom, or by concentrating on a major component of the picture depending on the pieces they pick up. Opportunists fared better when completing a jigsaw alone. Border obsessives tended to dominate in groups by controlling decisions and behaviour. Dr Hilary Johnson from the Human and Computer Interaction Laboratory at the University. said: "We are most interested in how both the activity and people's behaviour changes when they collaborate on an activity. "A person's jigsaw strategy closely reflects both their personality and level of skill, and although they may not be as extreme as opportunist or border obsessive, they frequently share behaviour with one of these two extremes." She added: "The strategies people employ to construct a jigsaw on their own can alter dramatically depending on their leadership skills and force of personality when they have to work with someone else. "This is especially so if the person they are working with has a completely contrasting style." The team will now develop a simple computer programme to test some of the theories they developed based on the research they have already carried out. Dr Johnson said: "Understanding how people collaborate is a very difficult task. There are all sorts of complex interactions at work, such as how well people know each other, their personality, their underlying leadership skills and so on. "We look for a range of signals in their conversation, their body language and gestures as well as how they plan, negotiate, help and hinder one another in performing the task. "By uncovering the frameworks people use to collaborate on computer-based activities we can use the information to develop software that will help people collaborate more effectively."